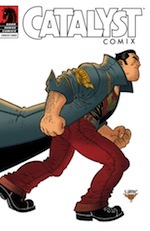 This week’s must-read in the Sunday Digest include Dark Horse’s Catalyst Comix from Joe Casey, artist Mike Henderson’s writing debut on Masks and Mobsters #9, a look back at the first 6 issues of app-based digital comic Upgrade Soul and new web comic iPhone app Multiplex from Gordon McAlpin. Dark Horse’s new wave of superhero books is given some bombast this week with a truly unique offering from writer Joe Casey. Resurrecting characters from their 90s Comics’ Greatest World, imprint each issue of Catalyst Comix is set out as a 3 part anthology with each character having their own separate chapter as part of an over lapping story at the centre that’s based around a single event. In other words it’s Rashamon meets 2000ad! Opening chapter The Ballad of Frank Wells is packed full of superb action with artist Dan McDaid evoking the classic 80s work of Frank Miller or John Romita Jr while chapter 2, Amazing Grace, sees Paul Maybury get all 2001 on us with a haunting intergalactic manga style story with stunning visuals. Last but by no means least are the Agents of Change drawn by Ulises Farinas which goes a bit old school 70s on us with a dash of Geof Darrow thrown in for good measure! Once this story arc runs its course the lead characters will swap order but whether the stories continue to overlap, only Casey knows. A bit verbose and dialogue heavy in places this is still a truly unique book and one worth checking out as there is nothing out there like this at the moment! Artist Mike Henderson’s writing debut on Masks and Mobsters is a delightfully dank and murky tale of a sub aquatic super villain being exploited by the gangsters of Golden City. Paying clear homage to Namor the Sub Mariner, but with a generous dose of Mer-man from Masters of the Universe, our unnamed underwater protagonist gets caught in the battle between gangsters and masks and is put to work by the mobsters under the impression that they are the good guys. But once this is revelaed to not be true he returns to the sea, but not before unleashing a sub aquatic nightmare on the surface dwellers. Henderson’s short and punchy offering is another great example of Masks and Mobsters one-off style and his artwork is truly stunning as you can see every brush stroke in ComiXology HD. Let’s hope this isn’t the last time we see him in the writers seat as it is a great first outing. This creepy existential sci-fi comic from writer/artist Ezra Claytan Daniels and developer Erik Loyer was a deserved part of our shortlist for digital comic of the year in 2012. Since then it has continued to go from strength to strength and is now up to 6 issues, with the story of Hank and Molly Nannar and their attempts to prolong their life through scientific upgrade still pushing emotional buttons but also the boundaries of digital comics in equal measure. With it’s smart layouts and subtle use of the iPad’s accelerometer to give pages 3 dimensions, it’s a really captivating and entrhalling read. 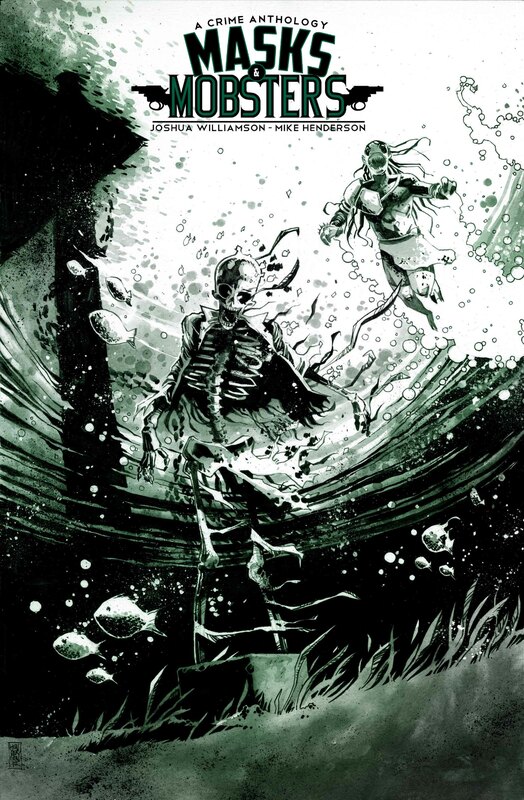 Daniels’ intricate and haunting artwork gives the book a really beautiful look while the unsung hero is Alexis Gideon’s atmospheric soundtrack which accompanies every page. With a new instalment just around the corner be sure to check out these first 6 issues to get you up to speed. You can download Upgrade Soul here and get issue 1 for free. Subsequent issues are available for $1.99 or $6.99 for the bundle. Mixing three of our favourite things – comics, apps and the movies – Godron McAlpin has ported his brilliant web comic series Multiplex into an iPhone app. Describing it as “a low-brow movie buff Kurt and a high-brow film snob Jason, who wage a never-ending battle against the terrible movies and even worse customers infesting their movie theater.” the web comic itself has been running online for eight years and this new venture is a way to bring Kurt and Jason to the masses. It’s a great way to consume digital comics with regular daily updates and a huge library of back episodes to check out. We’ll have more from Gordon on the site in the coming weeks, but in the meantime why not check out this brilliant app and enjoy the bickering world of Jason and Kurt.